As you can guess, we have been working on the next delicious installment in the Papa’s Gameria series. However, we were a little stumped as to who the next chefs should be. So we decided to leave it up to the fans to choose Papa Louie’s next employees. There will be two brackets, one battling for the boys position and the other battling for the girls position. From a pool of your 48 favorite customers, only 2 will remain to start work at the newest Papa’s restaurant (it’s a secret)! We have 3 divisions: the Pepperoni Division (red), the Onion Division (purple), and the Pineapple Division (yellow). We’ll post a voting poll for each pairing, where you can choose who should win and move on to the next round. 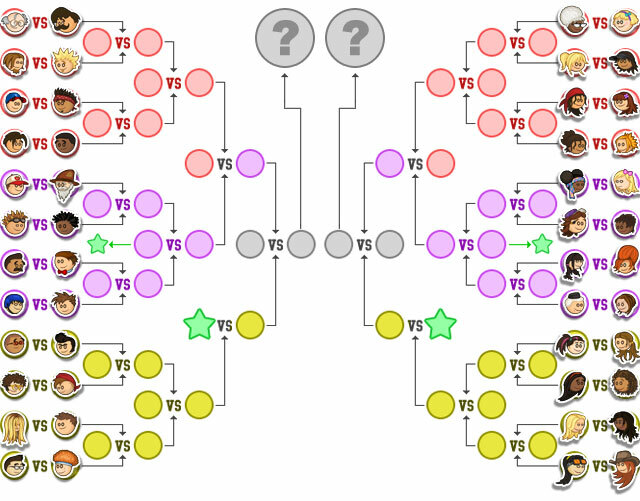 The tournament will be 5 rounds, with the winners of each round moving on to battle it out in the next. There is also a Wild Card spot (green star) that is earned by the losing customer in the 3rd round of the Onion Division. The loser will get a second chance by competing against the Pineapple Division Champ. We hope you are excited as we are to get this tournament started tomorrow, and get ready to vote for your favorites!